Why Become a Registered Community Partner? Becoming a registered partner with the Center for Community Engaged Learning signifies that your organization offers quality community engagement opportunities to volunteers. Weber State students, as well as their professors, know that your organization offers a safe environment at which to volunteer and that your mission and aims are in alignment with the highest standards. Registered partners also receive exclusive benefits. Partners receive benefits from their partnership with the Center for Community Engaged Learning based on the length of their partnership and the level of involvement they choose to have with the Center. These levels and their corresponding benefits are broken down into three tiers as shown below. Advertising one-time events is easy with our online, mobile app and physical 4’x 3’ calendars. Partners can post their events on all three calendars by filling out a short Post an Event to Our Calendar form on our website. Your organization can post flyers advertising volunteer positions on our bulletin board located in the Shepherd Student Union Building. The CCEL’s board is well maintained in order to ensure that volunteer opportunities don’t become lost under non-service opportunities such as roommate want ads. Each fall, WSU hosts an organization promotion event so large it has to be held outdoors. As an active partner with the CCEL, your organization can be one of the first in the school year to generate name recognition and recruit quality volunteers. Training modules are provided by the CCEL in order to ensure that volunteers are well prepared even before their first day of service. Your organization can require that volunteers complete one or more of eight different modules: Professionalism, Cultural Sensitivity, Ethics, Introduction to Tutoring and Mentoring, Mentoring, Tutoring, Pre-College Knowledge and FERPA. The CCEL keeps your organization current by highlighting upcoming events and opportunities. Newsletters may also contain articles on topics ranging from how to work with faculty to best practices for volunteer retention. Work-study is a federally-funded program that allows non-profits to hire part-time, qualifying students at 25% the cost of a typical employee (example: a student working for $8 an hour would receive $6 per hour from the government and $2 from the participating non-profit). The number of positions is limited and requires a contract with Weber State University. Each fall, the CCEL hosts an appreciation breakfast for our partners. This is the premier event for us to appreciate your partnership, for you to meet faculty and learn about upcoming developments in the CCEL. The directory posting is the information students will see when searching for service opportunities on our online Community Partner Directory. Limited directory postings list the organization name, contact information, and area of focus (e.g., healthcare, child education, environmental issues). The Volunteer Fair is one of the most productive ways to recruit new volunteers to your organization. Participating partners are provided breakfast, a table, chairs, and electrical hook-ups in the atrium of the Shepherd Student Union Building at Weber State. Our bi-annual volunteer fair is held sometime during the months of January and September. AmeriCorps has a venerable history extending back to the Civilian Conservation Corps created during the Franklin D. Roosevelt administration. The WSU AmeriCorps program grants education stipends to students who complete either 300 or 450 hours of service. Non-profits that provide opportunities to AmeriCorps students benefit greatly from having long-term, committed volunteers. Full directory postings provide all the information available in the basic posting as well as an in-depth look at your mission and current volunteer opportunities in the Community Partner Directory. The CCEL staff takes the responsibility to update your online posting each time you send us updates. The Wildcat Tech Expo is an annual WSU event where students and partners can come learn about new technology, gain skills and even get computer accessories for a cheap price. Obtaining new technological skills and knowledge can be very beneficial to your marketing and outreach efforts. Our on-campus broadcast media studio, Studio 76, has agreed to let our Wildcat and Purple Pride-tier partners use their sets, cameras, and technology free-of-charge to produce commercials, podcasts, etc. Please call the studio at 801-626-6682 to make an appointment. The Community Engaged Leaders Program (CELP) provides your organization with an on-campus student representative. Weber State University Community Engaged Leaders student leaders receive funds to help plan, develop, and execute events for your organization. Community Engaged Leaders student leaders also actively recruit other students to volunteer at these projects. Every event is tailored to your organization’s specific needs and can include: volunteer days at your organization, campus awareness events and fund raisers, to name just a few. A separate application is required during the month of January. The partnership page is a full web page dedicated to providing in-depth information about your organization. The CCEL partners with nearly 100 different non-profits; the partnership page helps your organization stand out from the rest. Students who have never volunteered at your organization may feel timid because they do not know what to expect. Virtual Tours break the ice, allowing students to familiarize themselves with your organization and meet the volunteer coordinator(s). The CCEL staff will produce this video for all Purple Pride partners. You will have the opportunity to review the video and make suggestions before it goes live on our website. The service symposium is WSU’s foremost service research event. Students present original research on topics related to the non-profit sphere. Purple Pride level partners receive access to AmeriCorps students as well as priority reservation for AmeriCorps positions at their organization. 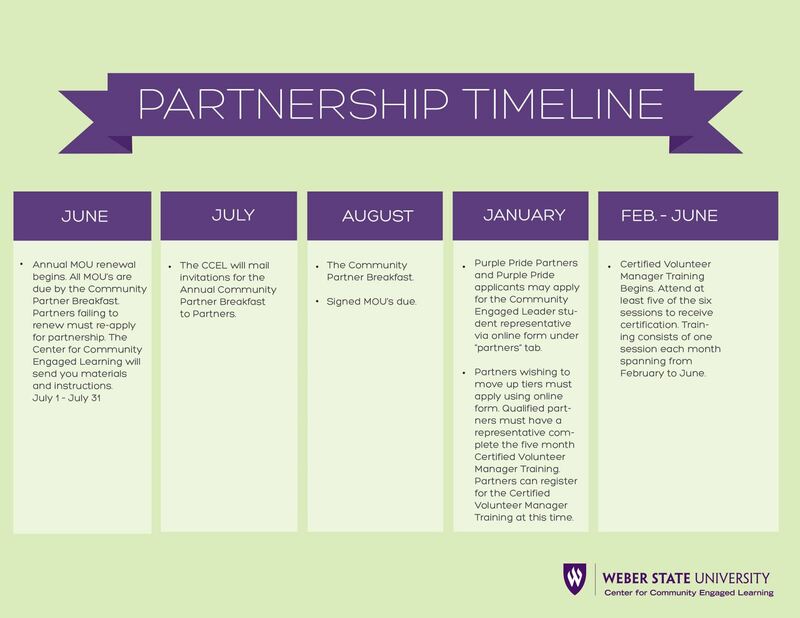 Typically, AmeriCorps positions are competitive because Weber State University supports a finite number of participants each year. Priority reservation means that your organization can request a number of these positions before they become scarce. Organizations are responsible for finding students who wish to participate in AmeriCorps and ensure that they attend the mandatory orientation at the beginning of each semester (January/September). Contact CCEL for more information. The Purple Pride Partners page on our website features a number of resources to help students learn more about your organization. One such feature is access to your organizations most current newsletter or electronic mailing. The CCEL staff will post your most current newsletter to our website as often as you send it to us. You will have a unique link on the CCEL mobile app to assist you in marketing and recruitment. Official 501(c)3 non-profits are defined by the Internal Revenue Service as organizations not established for making profit which receive a substantial part of their income from either the government or the public. Qualifying organizations can become 501(c)3 exempt by filing IRS form 1023. The CCEL verifies the 501(c)3 status through the EIN of all potential partners. All partners must have liability insurance and attest to ownership of insurance by signing the Memorandum of Understanding on an annual basis each June - August. To better serve our partners, the CCEL conducts an assessment each Spring. Feedback from the assessment helps CCEL staff to evaluate past services and develop new resources. Maintain information for our website including the current volunteer contact. Partners are responsible for keeping their information up-to-date. Obsolete contact information can often prevent students from contacting their community partner of choice. Expired volunteer opportunities frustrate students and waste the time of both parties. The CCEL may request a site visit in order to become familiarized with your organization’s services. Site visits generally last anywhere between 20-40 minutes and can be adjusted to fit availability. New partners must complete a short orientation that will guide them through the fundamentals of their new partnership with the CCEL. “Successfully partnering” means to comply with all the requirements of Cub level partnership. The CCEL sponsors four days of service each year: WSU's Service Day of Remembrance (September), Make-A-Difference Day (October), Martin Luther King Jr. Week of Service (January), and WSU Makes a Difference in Ogden (May). Hundreds of students volunteer for these days, offering a singular opportunity to complete large projects. Smaller groups from 15-25 students are also available. Each year, the Utah Commission on Service Volunteerism puts out training modules on how to recruit, train, retain, and recognize volunteers. The WSU Community Involvement Center presents five modules to our partners, once a month, February through June. To qualify for Wildcat and Purple Pride tiers, partners must attend 4 out of the 5 trainings. Once you complete the trainings, you become a certified volunteer manager. To maintain your Wildcat or Purple Pride status, someone at your organization, preferably the volunteer coordinator, must always be a certified volunteer manager. Learn more about training. This short information session will help you take full advantage of the resources provided by the CCEL. “Successfully partnering” means to comply with all the requirements of the Wildcat level partnership. Individuals from our partnerships can serve on four different committees: Hall Endowment for Community Outreach Committee, Awards Committee, CEL Curriculum Committee, and the Scholarship Committee. Each committee holds approximately 2-5 meetings each year. From time to time, the CCEL chooses to host meetings at a community partner site. One situation where on-site meetings are preferred is when faculty are being trained on how to incorporate community-based learning into their classes. Meeting at a partner site helps faculty get a feel for the atmosphere in which their students will be serving and allows them to learn about partner needs directly from the partners. Partnering with a faculty member is not the same as simply accepting students from university classes. A partnership is an intentional joint venture between you and a WSU faculty member. Both parties will work together to craft a service project that both suits the needs of the community partner as well as the learning outcomes of the faculty member. This can be a short, one-time project or an endeavor spanning several semesters. A successful partnership will be evaluated by the CCEL with input from the cooperating community partner, faculty, and CEL students. In addition to the annual community partner survey, Purple Pride partners will be asked to participate in another yearly survey that is more involved and in-depth, measuring the impact of student volunteers on your organization and the community. Assuming the co-educator role in student education means that you are partners with the faculty for not only the volunteer service, but also for the education of the student. When the students are learning in the classroom, the professor is the educator. When they are learning at your site, you are the educator. Hands-on experience in applying the skills and knowledge students learn in class to serve the community can greatly enhance their learning and opportunities for the future. This will be evaluated by the CCEL with input from the cooperating faculty, community partner, and CEL students. Fill out the required fields and submit your application. The CCEL will review your application and contact you. A response to your application can take from 1 to 2 weeks depending on the time of year. Upon application approval, we will require the submission of our Memorandum of Understanding (MOU) outlining the terms of the partnership. “The MOU is an at-will agreement and can be terminated by either party at any time. The Cub-level MOU web page will provide access to our form which you can complete and submit directly through our online system. It will also allow you to view the MOU to review the terms before you decide to partner. After you have submitted a completed MOU your organization will become an official partner. A copy of this completed form can be downloaded at any time for your records. The CCEL management will review your application and decide if your organization meets the criteria towards increasing your level of partnership. If your organization does not yet meet all criteria for advancement, you will be informed as to which requirements have not yet been met; we will also provide directions on how to fulfill these requirements. Should your organization qualify, we will provide access to information regarding your new benefits and responsibilities. Partners may change tiers only once per year (January). The CCEL will contact each partner with information regarding how and when to apply for a tier advancement. Any partner wishing to increase their level of partnership must send a representative to attend the Utah Commission on Volunteers Volunteer Management Certification Training provided at WSU campus. A certified Center for Community Engaged Learning staff member will present five modules over five months on topics ranging from volunteer recruitment to volunteer evaluation and assessment. In order to move from one tier to another, partners must send a representative to at least four of the five sessions. One organization representative does not need to attend all sessions. Example: Becky attends the first three sessions but cannot attend the fourth or fifth. Joseph, Becky’s colleague, may attend in her place. Representatives must be associated with their organizations volunteer program in some way. The CCEL will provide training materials as well as lunch at each session. Individuals completing the course will become State Certified Volunteer Managers and their organization will qualify to increase their level of partnership with the CCEL. The CCEL will send out reminders about the times and locations for Volunteer Management trainings as the dates approach.